It all began for me in a wood shop class at Edmond North Mid High. That's where I first fell in love with power tools, saw dust, and all things woodworking. A life long artist, woodworking was another outlet of creative expression for me, mixing form and design to create functional pieces. At the age of 19 I began building furniture, and by the age of 23 I was designing, building and repairing furniture for residential and commercial clients around the central Oklahoma area. I opened my first furniture shop in Oklahoma City in 1996, called Wm. Graeber Designs. Though building custom furniture was my focus, I also offered stringed instrument repair, antique restoration and reupholstering services. In 2000 I moved back to Edmond and opened Graeber Design, offering custom furniture, cabinetry, woodwork and finishing. In the years from 2000 to 2014 I took on every opportunity I could to learn and expand my skill sets. In 2015 I opened Rust & Rot Custom Furniture in North Edmond, offering unique and one of kind pieces of furniture and decor. The shop was originally focused on repurposing and upcycling of wonderful old finds into new custom pieces. As word spread and popularity of the shop grew, so did my return to custom designed and one of a kind furniture. So in early 2018 I returned to my roots, and Graeber Design was back. Now more than 20 years after opening that first furniture shop, it's my great joy to still be designing and building custom furniture for the residents and businesses of Central Oklahoma. Every piece with it's own unique style and story, and every piece guaranteed to last a lifetime. In my free time, I still try to stay involved in the arts. regularly completing large scale commissioned paintings for local designers and clients. I'm also a life long musician. Once playing and touring in bands, I'm more settled to song writing and small local performances these days, and on occasion belting out a tune at the shop. The original idea behind Graeber Design was to be a new concept in the Oklahoma furniture market. A place where you can order custom designed pieces made to your specifications. No matter what style, materials or dimensions you need, you can finally get exactly what you want without paying a fortune to get it. Just bring an idea, and we'll work to make it a reality. We're proud to offer Oklahoma's most originally designed, one of a kind custom furniture. We believe in making furniture that fits your unique style, taste, and need, no matter what they may be. We specialize in using solid hardwoods, reclaimed woods and structural metals, and turning them into custom furniture. No matter what you're looking for, we can bring your ideas to life. At Graeber Design we make beautiful, functional furniture. Each piece is handcrafted here in Edmond, Oklahoma, out of the best locally sourced and sustainable materials possible, and every piece we make is guaranteed to last a lifetime. We hope you enjoy our furniture as much as we enjoy building it, and we genuinely appreciate your support. Graeber Design is proud to use and offer the best locally available materials. We love Oklahoma, it's products, and it's rich history, and being able to put some of that love into the pieces we make just makes them even better! We never lose sight of the fact that the materials we use come from the Earth, and that every resource is precious. That's why we use materials from sustainable sources and tree farms, clean reclaimed woods and recycled metals. At Graeber Design we know that our reputation is built on the pieces we make. That's why we take care to make sure each piece lives up to the guarantee we put behind them. We aren't a large factory pumping out hundreds of pieces, we're a group a craftsman, that love what we do, and take great pride in the fact that each piece we build is built with our own hands. We're proud to be Oklahoma's only full line supplier of handcrafted custom furniture. We specialize in using the highest quality new and reclaimed woods in combination with structural and decorative metals to create beautiful pieces of furniture, guaranteed to last a lifetime. Every piece handcrafted right here in the heart of Oklahoma. At Graeber Design we care about you, your family and the world around us. 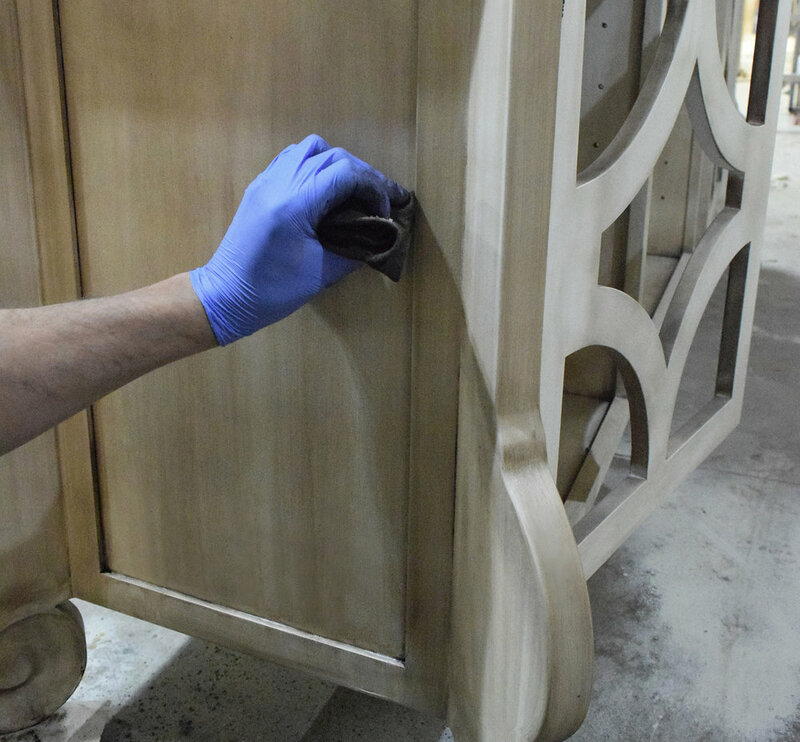 We only use quality, chemical free hardwoods in our furniture construction. We only use sustainably sourced woods, so to never add to the endangerment of the worlds tree population. We source our materials close to home, most from the Oklahoma / Texas region, to help support our local economy. So if you're in the market for a new piece of furniture, visit us for a no pressure consultation and quote. We look forward to meeting you!